From 1934 to 2020: 86 years of performances and emotions. The origins of the European Athletics Championships can be traced back to a meeting on 3 November 1932 of the newly-formed European Commission of the world governing body, what was then called the International Amateur Athletic Federation. At that meeting, it was decided – with the Hungarian sports administrator Szilard Stankovits the main advocate – that a continental championship should be held. The first European Athletics Championships was held in the Italian city of Turin across just three days, from 7-9 September 1934. It was a modest start, 23 countries sent 226 athletes and only men’s events were contested despite women being present on the athletics programme of the 1928 and 1932 Olympic Games. Notable absentees among the nations included Great Britain and the Soviet Union. It is evidence of just how much the competition has grown in the subsequent 84 years, both in importance and sheer numbers, that the Berlin 2018 European Athletics Championships, the 24th edition of the championships, saw 1439 athletes from 50 nations compete across seven days and there was complete equality among the genders for the first time with 24 events each. Separate championships for men and women were held in 1938 and the first post-World War II championship, in Oslo in 1946, were a landmark event that saw men and women compete together for the first time and a record number of almost 400 athletes. “These championships took place just a few months after I was born and, when I was young, I heard about how important these championships were: for sport, for society, for unifying Europe in the aftermath of World War II and for Norway. It was some of those early stories that motived me to get involved in athletics and ultimately strive for the position I have today,” recalls European Athletics President Svein Arne Hansen, who himself is Norwegian. The next seven decades saw the championships become one of the most important athletics events in the world, third only to the Olympic Games and the IAAF World Championships. They were organised on a four-yearly basis from 1946 to 1966 then a break in sequence in 1969 and 1971 before resuming the quadrennial cycle between 1974 to 2010, the organisation of the championships being taken on by the forerunner of European Athletics, the European Athletic Association, upon its formation in 1970. 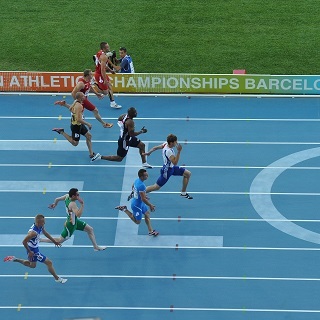 However, in keeping with the federation’s mandate to continue to make athletics relevant to contemporary society and the sport’s stakeholders, the European Athletics Championships have been organised every two years since 2012; and in 2018 the championships were part of the inaugural multi-sport European Championships. The list of European champions contains nearly every star of the sport from the continent. Notable among those who have graced the top of the podium at the championships, nobody has won more medals than the 10 accumulated by Poland’s late Irina Szewinska between 1966 and 1978. French sprinter Christophe Lemaitre tops the men’s list with eight medals between 2010 and 2014. Fully deserving of a mention as well is Croatia’s Sandra Perkovic who has won an unrivalled five consecutive discus gold medals between 2010 and 2018 and she may yet add further to her tally.